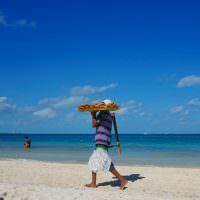 Goats on the Road Posts » Travel Blogs » Central America & The Caribbean » Mexico » Hola Mexico! We Have Arrived! 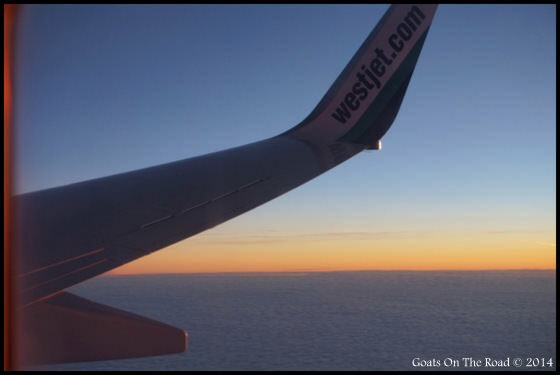 Despite being in Canada for nearly six weeks, our departure seemed to creep up on us and suddenly we were saying our teary goodbyes to friends and family and before we knew it we were at the airport waiting for our flight to Cancun, which is one of the best places to visit in Mexico. As the wheels of the plane lifted off the ground and we left the frozen tundra behind, there was a mixture of feelings, but mostly we felt excitement. We had left a few things to the last minute before setting off on this journey. 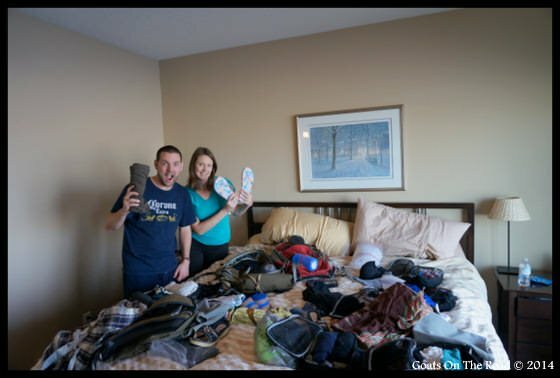 With all of the visiting we barely found time to pack our bags and we’ve now realized that we forgot a couple of essentials! We usually to price out hotel rooms, buy travel insurance and have a rough itinerary before leaving and somehow we barely found time to do all of this. We found ourselves searching online on our last day for a fair quote for travel insurance and rushing to pack our bags. The longer our lives remain on the road, the harder it is to find an insurance company that will cover us! But everything worked out and as the plane lifted off, all of those worries were left behind. This is our next adventure, and we’ve been looking forward to it for months. 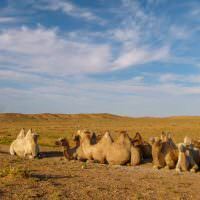 We had this trip in the back of our minds, even while we were hiking the steppe in Mongolia and horse trekking over mountain passes in Kyrgyzstan. With each laubored breath we took in the high altitude cold, we had the snowy white sands of Mexico in the back of our minds. Our flight was delayed for a couple of hours so we didn’t even land in Cancun until after midnight. Then we had to wait in line at the terribly understaffed Cancun Airport which had only two immigration desks open for the 300 or so passengers that showed up at the same time. 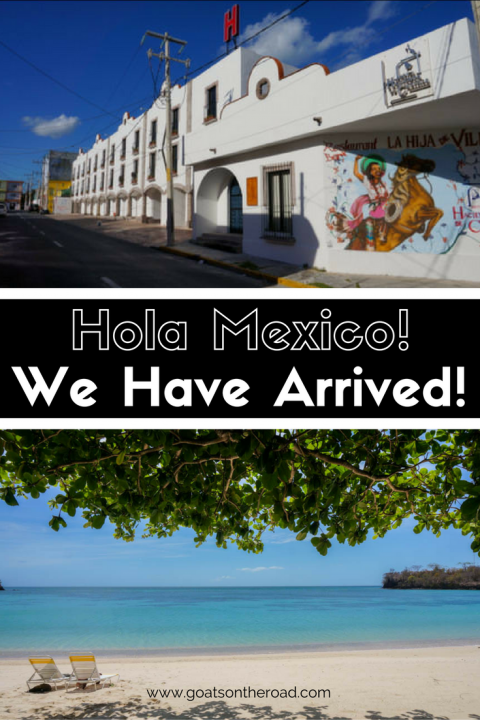 As soon as we exited the airport the thick, humid smell of Mexico filled our nostrils. We’re here! Finally we were in a taxi and heading for our hotel. 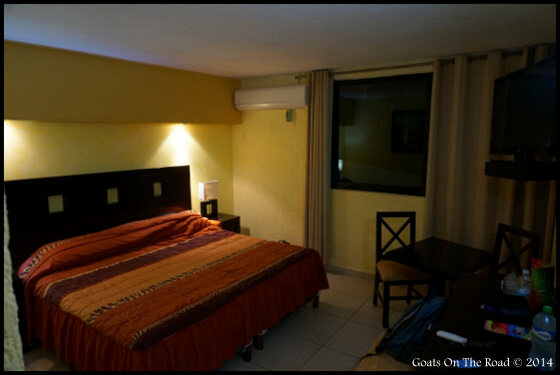 We ended up checking in to our beautifully Mexican styled room at around 2:30 am. We quickly hit the sheets and tried to get a decent sleep as to not ruin our first day in the vibrant city – there are so many things to do in Cancun! We woke up at quarter after nine, about an hour before our set alarm. We were too excited to sleep any more. 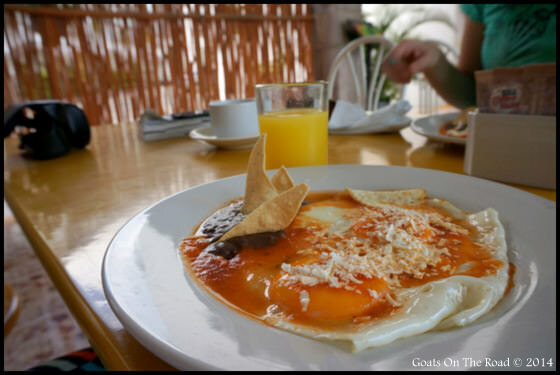 We slumped out of bed in a groggy fog and headed down to our hotel’s restaurant where we had our first Mexican meal, a Ranchero breakfast. 2 fried eggs on a freshly made corn tortilla with Ranchero sauce drizzled on top and a side of refried black beans and taco chips. Delicious! We left the hotel and hit the streets. Right away the flavour of Mexico filled the air. Guitar music echoed in the busy streets and taco stands soaked the air with the tantalizing aroma of cumin and salsa (I know, almost too cliche). We’re staying about 2 km north of the city center (or centro) and our neighbourhood is delightfully authentic. Not a tourist in sight, which actually surprised us coming to one of the most touristed cities on earth. 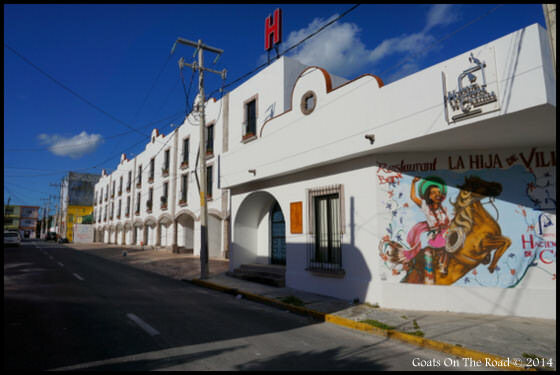 We slowly sauntered down the main street of Ave Tulum, taking in the sights and sounds along the way. We knew we were in Cancun for some beach time, and we couldn’t have been happier being here as we hadn’t seen a beach in nearly two years! So, we popped into a grocery store and bought a few Coronas before getting on the 10 Peso, R1 bus to Zona Hotelera (you can translate that I’m sure). As the bus rounded the bend we got our first glimpse of the beach and it was even more beautiful than we remember. We hopped off the bus near Casa Maya Resort and went straight to the beach. Powder white sand and aqua marine waters greeted us with even more beauty than we had expected. We ran right into the water and as my head submersed under the refreshing clear sea, I was instantly reminded of why I love the beach. We love trekking, we love villages, we love history and we love culture, but there’s always something about the beach. It’s a completely different kind of travel. We’re looking forward to spending a few months here soaking up the tropical weather, finding off-the-beaten path places and enjoying all the things to do in Mexico before heading to our House Sitting gig in the southern Caribbean. Ha! 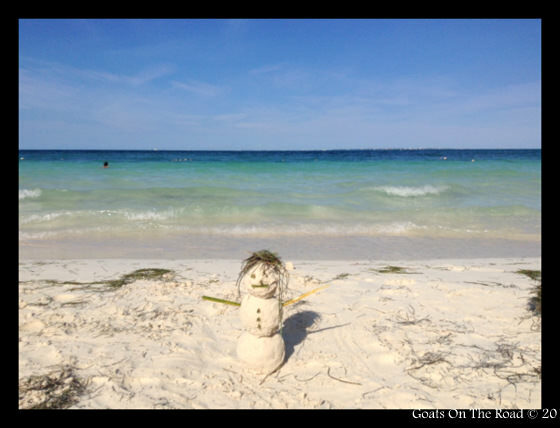 I love the sand/snow man on the beach! Sounds like a great start to your time in Mexico – definitely looking forward to hearing more. So far it’s been great. We love the vibe, the food and how colourful everything is! Hmmm, that’s a tough call. India is fantastic, insanely different from anywhere else you’ll go and we absolutely love it there. It’s probably the complete opposite of Mexico actually. Wish I could have been with u on that gorgeous beach….wait…what am I saying…I was!What a blast…had fun!Miss u guys.all the best on the trails ahead.Hope we meet again soon. Definitely good times Bern! Lucky number 7! haha. Hopefully we make it country #8 soon 🙂 All the best, enjoy Belize. That’s wonderful that you’re taking off travelling! We’ve never been to Fiji, you’ll have to tell us all about it. Welcome to Mexico! Such a deja-vu this post of yours, since we stayed in the exactly same hotel when we arrived a few weeks back. And ate the same breakfast, and bought our daily supply of Corona 🙂 We then headed to Merida, which I really recommend. No beach though, but a nice city. And the food is so good, not getting bored of it even after 3 weeks of constant Mexican diet. Now we are on a beach, in outskirts of a tiny fisherman town of Chicxulub. It’s very quiet and peaceful this time of the year, with only some locals and a few Canadian retirees. Which places are you planning to visit? So glad that you guys are loving it so far! The food and coronas and margaritas are dangerous business here 😉 Can’t wait to follow your stories from the other side of Mexico, and can’t wait until we can finally plan a meet up!!! Can’t wait to meet up too…email you soon. Enjoy! What did you guys end up finding for insurance? Pretty soon we’ll be out of our home province too long and lose our provincial health coverage, which will make our current World Nomads impossible. Bah!! This is a tough call. For us, we are allowed to be out of Alberta for 2 years and then we have to come back in order to have the 2 years set again. Which has worked for us thus far. But we did look into some forms of Expat Insurance (which are more expensive and limited as to what is covered). excited to hear all about your travels and follow goats on the road… luv u D! Excited to hear about your time in Cancun! Being from New York, I haven’t gone there yet only because of the “Spring Break stereotype” but I know that’s not all of Cancun and I need to visit. Post more beach pics please too! Do you guys scuba dive or snorkel? I have to agree, there is something about the beach and it is a completely different kind of travel. So happy for you guys and I hope you have a wonderful time! By the way, the snowman? is just too cute! haha, thanks Barbara 🙂 I guess subconsciously we were missing the snow back in Canada? Who knows, either way, it was fun creating him. Out of interest what travel insurance company did you use? Hey Adam, thanks for the comment. We used to go with World Nomads, but we’ve found a cheaper one through Travel Cuts (I think it may be Canadian?) We’re not doing the extreme stuff like we were doing in Central America, so we didn’t need to make sure we were covered for anything but the basics. Btw – your blog rocks!